52 Treats I Can Eat | Featuring an allergy free treat of the week every week of the year! So, I am diverting from the sweet treats and giving you all an amazing comfort food side dish just in time for Thanksgiving. We had our menu set until I tried this recipe for the first time last night and my husband said “You have to add this to the Thanksgiving Menu this year!” I have been a fan of Daiya shredded cheese since my first bite. I knew it melted well, so I finally buckled down and created a (SO VERY YUMMY!) baked macaroni and cheese recipe. I also used So Delicious Coconut Milk as my milk of choice for this recipe. I have found that the So Delicious Milk is the thickest and most creamy milk substitute in my opinion. Plus it just tastes great! 🙂 Feel free to substitute with your “milk” of choice, but I can vouch for the fact that the coconut milk will thicken up nicely in the first step of the recipe! Enjoy and I hope you will get as much pleasure out of this side dish (or main course?) as we plan to on Thanksgiving Day! Melt butter in a large saucepan over medium-low heat. Whisk in flour until it is absorbed. Gradually add coconut milk, stirring constantly until thickened. (It takes about 5-7 minutes to get to a thicker consistency.) Remove from heat. Stir in salt, black pepper, red pepper, half of the bag of Daiya cheese and cooked pasta. Mix well. Spoon pasta mixture into a greased 2 qt. baking dish and top with remaining cheese. Bake at 400º for 20 minutes. Serve warm. We really enjoyed having a typical cheesy side dish that would normally be off limits in our home. My four year old had two large helpings and as he was eating he said “Now I can eat macaroni and cheese like all my friends!” This is the reason why I bake and create “normal” foods into allergy free creations. The smiles I got from my son (and my food allergy free husband for that matter!) last night were so worth the time spent coming up with this recipe! Again, I hope you will enjoy this as much as we did! Finally! A new recipe! And this one is so simple and quick! I was about to make dinner last night when I noticed a can of crescent rolls in my fridge about to expire. I just cannot let that happen! Baby was wanting something a little sweet, so I dug out some goodies from the pantry and put it in the oven, hoping for something yummy to emerge. Boy, did it ever! I didn’t use accurate measurements, but wrote my best estimate for the recipe. This one doesn’t require an exact science. You can add more or less as you like. They were gone in less time than it took to make them, so I will certainly keep this recipe in mind for a quick little snack! Preheat oven to 375º. Mix raisins, coconut, cinnamon sugar with melted butter substitute. Unroll crescent rolls into triangles. Spoon raisin mixture over triangles and roll into crescents. Sprinkle a little more cinnamon sugar on top, if you choose. Bake about 12 minutes, or until brown. Attempt to let cool. ENJOY! I promised yesterday that I had a good excuse for not blogging. What is that excuse, you may ask? My husband and I are expecting our second child! We are thrilled and so is big brother Caleb! I am due February 1. I felt horrible at first, so I stayed as far away from cooking and baking as I could. I do have some recipes that I have tried, so I will try to get them up in a more timely manner now. Honestly, most of the stuff I have baked has been someone else’s tried and true recipe. There is nothing worse than having a craving for something, taking the time to bake it, and it turning out all wrong! So, I have stuck with what I know works and what I know is good! I will say this pregnancy has just worn me out. I feel like I am always in a bit of a fog, but it will totally be worth it come February! I know it has been a very, very LONG time since I posted last, and I promise I have a very good reason, which I will get to in a later blog. However, I first wanted to take the time to remember two precious lives that have been lost recently in my home state of Georgia because of a food allergy. I did not know these boys personally, but as a mother of a food allergic child, it rips my heart out to hear of deaths in children, especially when it comes on account of them eating something they are allergic to. The deaths of 15-year-old Jharell Dillard and 20-year-old Tyler Davis (which is still an unconfirmed death from his allergy, as toxicology reports are still pending at the time of this blog post) are tragic reminders of why we need to educate our children, our families and our caregivers about the importance of always carrying epi-pens if you have an allergy. These lives were taken too soon. I pray for their families as they try to find peace and understanding in losing their loved ones. I also pray that the family of Tyler Davis will be provided with quick answers as to what happened at his University dining hall. Two lives lost in Georgia in a matter of three days because of a food. It is scary. It is sad. And something needs to be done. Please don’t let these boys have died in vain. Always be vigilant about carrying your epi-pen, reading food labels and educating your children about the importance of not eating foods they aren’t sure about. Anaphylactic reactions happen SO very fast. Just because you have not experienced it in the past, does not mean it cannot happen to you or someone you love. All I can say is be vigilant, my friends. Please keep these families in your prayers and hug your loved ones tight tonight. I am so very sorry for the lack of posts. I actually have quite a few recipes to post. I just need to sit down and DO it! In the meantime, here is my latest creation. This was a fun cake to recreate. My friend Megan is known for making the best chocolate cake. When given out in a group setting, these cakes are known to cause a few arguments of who gets the first slice, who takes it home, etc. This was also one of her favorite recipes to enjoy. However, Megan has recently had to stop consuming dairy and eggs. She frequently follows my blog (Hi Megan!) and recently reminded me that it was time for some new recipes. I wanted to make this cake so she could enjoy it again, so I asked for her original recipe and told her I would recreate it so she could eat it! I think my tweaks turned out great. I will say this isn’t your typical chocolate cake and I wouldn’t recommend this recipe for cupcakes, as they would be more dense and rich than you would want them. However, as a cake…this is just SO good and a nice treat when you need a chocolate fix. As Megan usually does, I made this into three mini-loaf cakes. One for home and two to share! Mix sugar and flour in a large bowl. Bring water, cocoa and margarine to a low boil over low heat. Mix into flour mixture. Add eggs, buttermilk, baking soda and vanilla. Mix well and pour into greased pan(s). Note that this is a very thin batter, do not think you have done something wrong! 🙂 Bake at 350º for 40 minutes. While cake is baking, prepare icing. Bring margarine, cocoa and rice/soy milk to a low boil. Remove from heat and add remaining ingredients. After cake has baked for 40 minutes, remove from oven and pour icing on top of cake. Return to oven for another 5 minutes. Let me tell you. I have found a new favorite cupcake!! My son’s class celebrated Dr. Seuss’ birthday last week. I, of course, quickly jumped at the chance to bring in some cupcakes for the class. This time, with a new twist on the class treat. One other child in his class now has an intolerance to food dyes. Being the mom of a food allergic child, the thought of sending in cupcakes with food coloring was never even considered. I know how my child feels when he gets left out of an event, and I sure was not going to allow that to happen to another child! Yes, I could have gone crazy with the color for these, but I am actually thankful that I didn’t! It lead me to try something new….LEMON CUPCAKES! I cannot even begin to tell you how fast these cupcakes were eaten in our house. It made 28 cupcakes, there are 8 kids in his class and they were gone by Saturday night! Two days! Really!?? I hope you will enjoy these cupcakes just as much as we did! In a mixing bowl fitted with a paddle attachment, cream butter and sugar together. Beat in applesauce, lemon peel and vanilla extract; mix well. Fill muffin cups with 1/4 c. of batter. Bake at 350 degrees for 25 minutes or until a toothpick inserted near the center comes out clean. Cool for 10 minutes then remove from pans and allow to cool completely on wire racks before icing. NOTE: These cupcakes are not overbearing with the lemon peel and would be excellent topped with any of your favorite icing. You may even just omit the lemon peel for a delicious vanilla cupcake! Cream butter and sugar in a small mixing bowl. Add lemon juice, vanilla and lemon peel. Beat until smooth. Ummm, hello!?? Remember me? I seriously can’t believe that i haven’t posted in a month! I have tried some yummy recipes in that time span, but obviously never got to my blog to tell you about them. I will work on it….starting NOW! That’s right! A new recipe from yours truly! I saw a recipe in the latest issue of Taste of Home and HAD to adapt it that very night to make it allergy free. I am so glad that I did! These were very yummy! The banana cookie was more like a banana bread and the icing in the middle? DELICIOUS! I hope you enjoy these as much as we did! In a large bowl, cream margarine and sugars until light and fluffy. Beat in egg and vanilla. In a separate bowl, combine banana and butter milk. Combine the flour, salt, baking powder and baking soda in another bowl. Gradually add banana mixture and flour mixture, alternately, into creamed mixture. Heat oven to 350º and line baking sheets with parchment paper. Drop mixture by tablespoonfuls 2 inches apart onto prepared baking sheets. Bake at 350º for 12-15 minutes or until set. Cool for at least 2 minutes before transferring to wire racks to cool completely. For the icing, in a large bowl, beat the cream cheese, sunbutter and margarine until fluffy. Beat in confectioners sugar and vanilla extract until smooth. Spread filling on the bottoms of half the cookies, about 1 tablespoon on each; top with remaining cookies. Store in refrigerator. Welcome to another long over due post. I was so proud of myself for my outer space creation and couldn’t wait to blog about it…and then the Great Georgia Snow came and shut the state down for over a week! So, I am now back at it and I hope you will enjoy this very simple recipe. This would be great for birthday parties or classroom parties for a space, ocean or sky theme! My son was learning about space in his daycare class. All the kids in his class were going home from school telling mommy and daddy about outer space and the planets…and I guarantee each child in the 3 year old room (yes 3 years old, and all with a new-found Space obsession!) will be happy to tell you about “Poor Planet Pluto” -insert sad face here -and how Pluto is no longer a planet. Since they were enjoying their weekly theme so much, I wanted to send in a special treat for the class. To say it was a hit would be an understatement! It was very simple, but the marshmallow cream I came up with for the clouds, in place of whipped cream, was VERY hard to work with. Next time, I will experiment with coconut milk. I have read some people say that they have made a whipping cream from it before… (don’t worry, I will be sure to let you know when I try it out!) For now, please enjoy this fun little recipe! Prepare Jello as listed on package for quick set method. Chill the jello while you melt the margarine in a pot over medium heat. Stir in marshmallows. 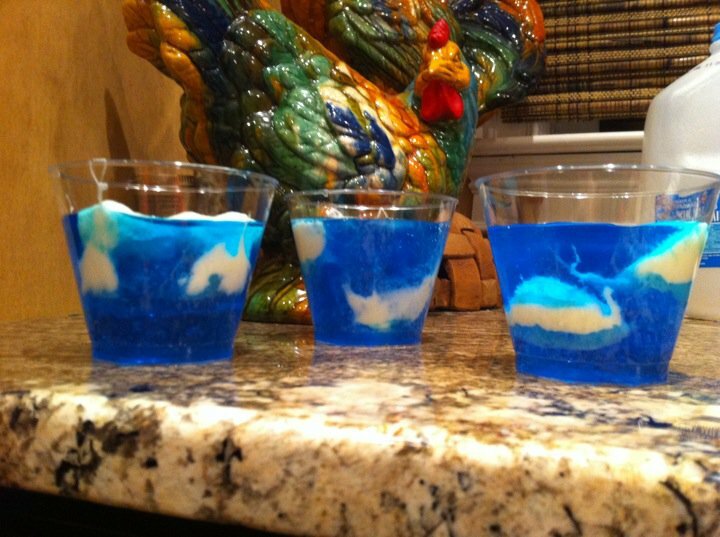 Once the marshmallow mixture is melted, bring out your jello mixture. (the mix should not be set. Just thick enough to spoon into cups.) Layer in the jello and use a greased spatula to place the marshmallow mixture into the cups. Use as many “clouds” as you like. Spoon jello over the top. Turn stove top to low and keep the mixture stirred to prevent scorching. The mixture is very sticky. If you must use fingers to remove mixture from spoon, be sure to grease your fingers. I found it easier to place the “cloud” onto the side of the cup and stick it to the side of the cup, rather than just placing it in the jello. For an adult party, serve these in wine or cocktail glasses for a nicer touch! First of all, let me start off by saying HAPPY NEW YEAR! I hope 2011 is off to a good start for all of you. My last post, which was WAY too long ago, I told you about our house flood. Can you believe we are still not back in our house yet? Yep, two holidays spent outside of our house. In light of being in a different house, we still had a wonderful holiday season filled with lots of laughter, love and new memories. We should hopefully be back in our house next weekend (fingers crossed!). That will really help me with keeping up with recipes. I have missed my kitchen and all my “stuff,” so it will be really good to get home! 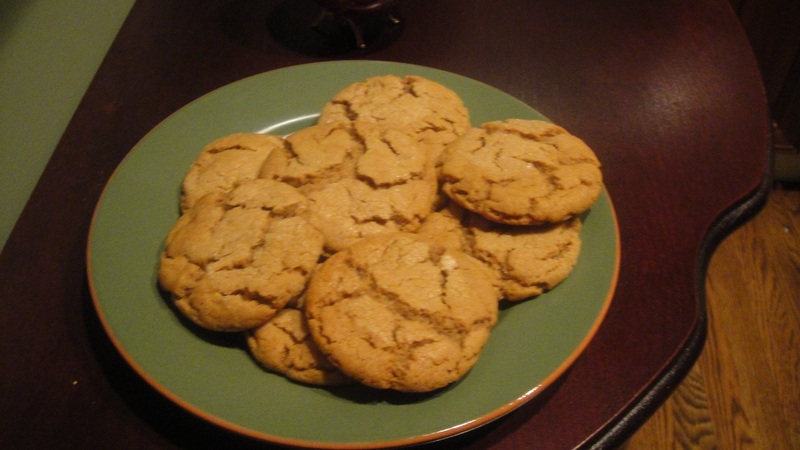 That being said, I did make some delicious cookies that I wanted to share with you. Over the Holidays I picked up some molasses to make gingerbread (which also turned out great!) and on the back was a recipe for “Grandma’s Molasses Cookies.” My husband begged me to make them, so I finally obliged and tweaked it so Caleb could also eat them. OMG. I have a new favorite cookie recipe! Again, it is adapted from the back of the Grandma’s Molasses jar. I hope you will enjoy! In a mixer, combine shortening, brown sugar, applesauce and molasses. In a separate bowl, whisk together flour, baking soda, salt, cloves, cinnamon and ginger. Add to your wet mixture and chill. Preheat oven to 375°. Roll dough into balls the size of walnuts and dip tops into your reserved white sugar. Place sugar side up on baking sheet. To create your cracked surface, drip 2-3 drops of water on top of the cookie balls. Bake 10-12 minutes. Thanksgiving time! Today was my 3 year old’s Thanksgiving feast at his daycare. Everyone brought in the traditional foods, none of which my son could eat. (To make his lunch extra special today, he got Chick Fil-A….I think some of his friends may want his special lunches from now on!) I always volunteer for the treat for class parties. That is the hardest to bring in a similar food, so I always sign up as soon as I can. 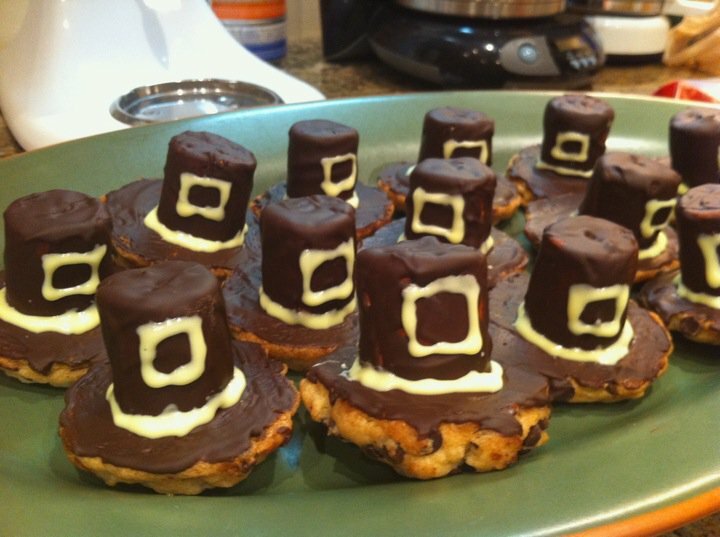 This year, I wanted to make Pilgrim Hat Cookies. There are many recipes online, but ALL of them call for fudge stripe cookies. To make it egg, nut and dairy free, I opted to make my favorite allergen free chocolate chip cookie recipe from the Food Allergy Mama. All of her recipes are awesome, and I didn’t want to experiment for such a well-respected classroom full of foodies! Let’s face it….toddlers are picky. Well, they all LOVED these! If you want the exact recipe, please leave me a message or pick up a copy of the Food Allergy Mama’s Baking Book (there is a little plug!) for the chocolate chip cookie recipe. The rest of the recipe was the same as the numerous posts I found on the Internet. I used Enjoy Life Chocolate Chips to create the chocolate base and to put around the marshmallows. It worked great! You get an iPhone pic for today, as we are still working out kinks from our house flood. Enjoy and have a blessed Thanksgiving!